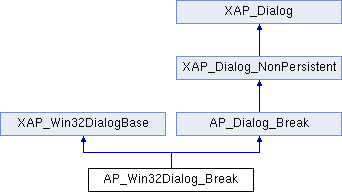 References XAP_Win32DialogBase::isChecked(), AP_Dialog_Break::m_answer, AP_Dialog_Break::m_break, and UT_DEBUGMSG. References _DS, _DSX, XAP_Win32DialogBase::centerDialog(), XAP_Win32DialogBase::checkButton(), XAP_App::getStringSet(), XAP_StringSet::getValue(), AP_Dialog_Break::m_break, XAP_Dialog::m_pApp, and XAP_Win32DialogBase::setDialogTitle(). References AP_DIALOG_ID_BREAK, XAP_Win32DialogBase::createModal(), XAP_Dialog::m_id, XAP_Dialog::m_pApp, XAP_Win32DialogBase::setDialog(), UT_return_if_fail, and XAP_Win32LabelledSeparator_RegisterClass().